Authorities say multiple people have died after a lone suspect opened fire at the Ft. Lauderdale, Florida, international airport. The Broward County Sheriff’s Office tweeted the information following Friday afternoon’s shooting. 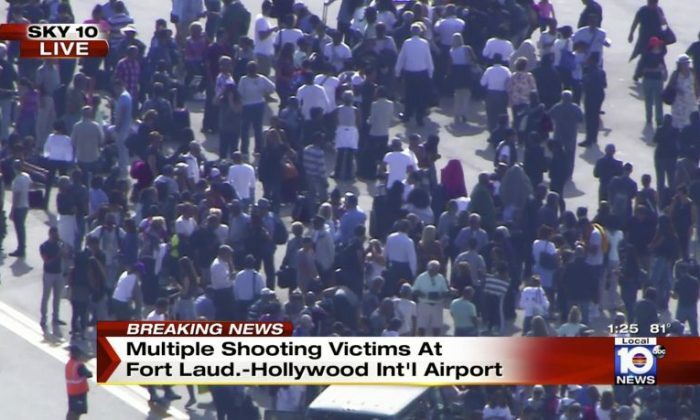 NBC Miami reported that at least nine people were shot in the incident, four of them fatally. The broadcaster cited local law enforcement sources for its information. Miami area television stations reported that at least six people were shot. News stations showed video of medics taking care of a bleeding victim outside the airport. News helicopters hovering over the scene showed hundreds of people standing on the tarmac as an ambulance drove by and numerous law enforcement officers, including tactical units, rushed to the scene. “I was dodging bullets and trying to help people get out of the way,” witness Mark Lea told NBC of the shooting, which occurred inside the baggage claim area.